Overall Print Size: 23" x 33"
There are few truly defining moments in the history of a State - single episodes that touch every citizen, and cast a nation's future. Epoch-making events that influence the entire world are even more uncommon. The events that took place in the space of less than two hours on the morning of December 7, 1941 were of such defining importance, their memory is now deeply embedded into the history of the Twentieth Century. At ten minutes to eight, as the US Pacific fleet lazily came awake suddenly, and without warning, the world around them exploded with all the mighty force of thunder: Within seconds Pearl Harbor became cloaked with attacking Japanese aircraft. Before sailors could comprehend what was happening, bombs and torpedoes had ripped out the heart of the fleet: Four of eight battleships were sunk; a dozen more naval vessels lay stricken in the water; 2400 souls perished. In those terrible few moments, the tranquil scene was transformed into a boiling cauldron of explosions, fire, smoke and unimaginable destruction. Pearl Harbor became a ranging inferno. 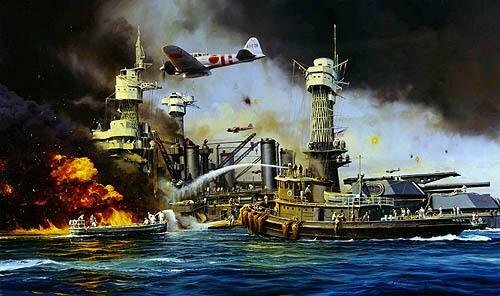 Robert Taylor's specially commissioned masterpiece recreated desperate moments during the second wave attack at around 9am on December 7, 1941. Having taken six torpedo hits and two bomb strikes in the first wave attack on 'Battleship Row', the West Virginia is ablaze, her bows already low in the water and decks awash. Ignoring the risks, crews push the navy tug Hoga alongside with fire-fighting equipment and to pick up survivors. Overhead, Japanese Zeros swoop through the smoke, aiming the second wave attack at installations on Pearl Harbor's Ford Island, to complete one of history's most devastating unprovoked declarations of war.